Just the other day, we told you that the long awaited Samsung ATIV S would be available Tuesday from T-Mobile Austria free on contract. Those kidders at T-Mobile Austria even took a picture of the phone laying on Tuesday's newspaper as proof that it was in stock. That's the kind of humor we love to see. What we also love to see is more countries with the Samsung ATIV S and it would seem that a few U.K. retailers will have the device starting as soon as today. 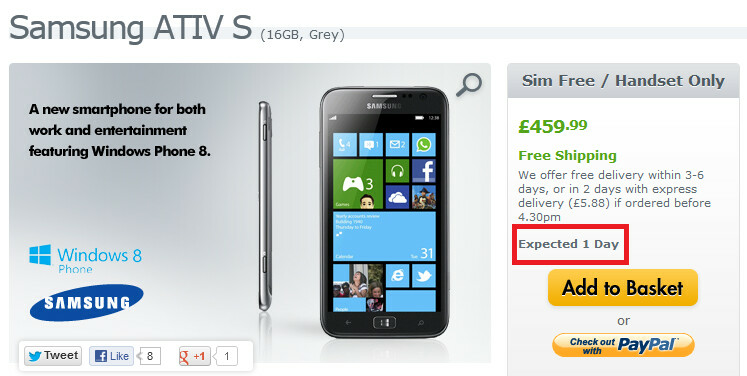 Clove's web site shows the phone arriving at the retailer on Thursday while Unlocked-Mobile and Expansys both say that its customers who pre-ordered the Windows Phone 8 flavored handset, will have it shipped on December 14th. Unlocked-Mobile has the phone priced at £424.98 ($686 USD) while Clove's price tag reads £442.80 ($714 USD) and Expansys' shows £459.99 ($742 USD). Also on the 14th, a couple of Canadian carriers will be launching the phone. 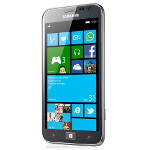 TELUS will have a limited quantity of the Samsung ATIV S while Bell will also offer the device on Friday. Both have the model priced at under $100 on contract. The Samsung ATIV S was the first of the new Windows Phone 8 models to be announced and now it looks like it will be among the last to be launched. Still, it beats the rumored February launch date that was making the rounds recently until the speculation was quashed by Samsung. Yes, the Nokia series is the big dog in the WP pound. But why on EARTH do people keep saying "too late"? Is there only one Android? Will no one release another Jelly Bean device because they didn't get there first? For that matter, have people not bought the iPhone 5, or stopped buying the iPhone 4 or 4S, just because one model came first or supplanted the other? Silly. WP 8 is much better with Samsung in the fold, and if Sammy promotes it (big "if" I know) then the ATIV S has zero to worry about. Contracts are not magically drying up. There will be lots of people still buying phones for the next few months. This has a ton of good specs with the Samsung name behind it. Get on as many carriers as the 8X, and I like it's chances. for me Ativ S is still a better choice. its sleek, thin, replaceable battery, micro SD card slot. and yes better than 920 except low light camera performance.But, i don't care about low light camera performance. Painted plastic is better than that dumb 11 mm thick 920. eagerly waiting for India launch. well. your comment explain that you are a dumb not mine.I think you need some coaching classes to learn things. in above comment i did not mentioned actual weight of LN 920. thickness is different than weight. MIND IT. first read my commnt properly and then comment. Oops my bad, didn't read it well because a lot of women keep commenting about the weight and thickness and im tired of reading those :P Well, Lumia 920 isn't dumb like the completely normal painted plastic phones, Learn about the features of phones and how innovative some new phones are. There is a reason behind its thickness that makes the phone such an awesome device, you cant call it dumb unless you are dumb..
ha ha...i cant control my laugh after reading your comment..i feel pity for you.... in phonearena awards it even failed to make it to 3rd place. lol...even phonearena also knows that its dumb phone. ha ha...i know i m wasting my time here..you keep trolling here...your troll cant change my or someones decision.